Canon EOS C300 is an old model but still popular professional HD camcorder. Many C300 users record multi-track MXF footage with difference microphones for better audio quality. However, when they want to edit the MXF footage with 2 tracks in FCP, they will find it is really a challenge to convert MXF into MOV with 2 separate audio. "I tried to convert MXF file of Canon C300 into MOV and want to get 2 separate audio tracks. The multiple software I have tried just mix 2 tracks into one. Is there a solution?" 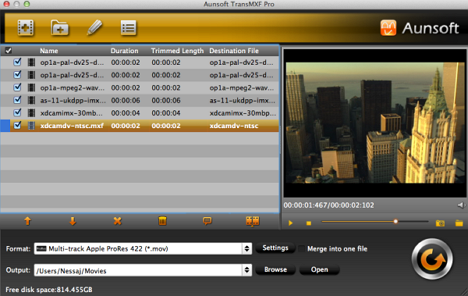 At present, most conversion tool will automatically combine all tracks into 1 track when converting MXF to ProRes MOV. 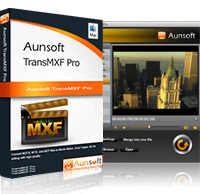 In the case, Aunsoft TransMXF Pro for Mac stands out as the only completely multichannel MXF solution to preserve, export and preserve multiple audio streams from original MXF. When MXF are with track 1 and track 2 recorded by different mics, the Pro can easily convert C300 MXF to MOV with 2 separate channels of audio. Actually, no matter MXF footages from Panasonic P2, Canon camcorders are recorded with 2, 4, 8 or more audio tracks, you can easily preserve all tracks or get separated channels of audio from source file. Have you experienced the situation that the video plays great but the audio are out of sync? Have you anxiously asked help to solve the audio issues coming with MXF to MOV conversion, such as no audio, audio losing or audio cut-off? Adopting advanced audio and video encoding technology, TransMXF Pro for Mac is best to solve audio issues. As soon as you import MXF to the program, the Pro can automatically load audio counterparts and the output file will be with perfect audio and video synchronization. Below is a simple tutorial to transcode Canon C300 MXF to ProRes MOV for getting 2 separate tracks in FCP. If you don't need to separate audio tracks, TransMXF for Mac will be a good alternative, effective and affordable. Click "add video" or "add folder" to load multiple audio channels. You can also directly drag files to the program. The program supports batch conversion and allows you capture images. Click the "format" and choose the "Multi-track Video -> Multi-track Apple ProPres 422(*.mov)" files as the output format. Click "settings" to preserve separate audio tracks in original MXF. The screenshot shows 4 tracks of audio, if your source MXF with 2 tracks, you will get 2 channels here. 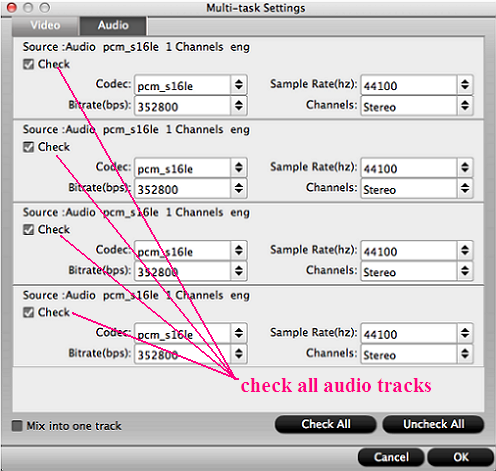 You have more choices, if you don’t want to keep all audio tracks, you can uncheck undesired ones. You also can mix multi-audio tracks into individual track. Click "Start Conversion" icon, TransMXF Pro for Mac will convert MXF to ProRes MOV with 2 separate audio with high quality. You can preview output file when conversion completed.